A typical Irish soda quick bread made with buttermilk and rye flour. So delicious when warm just out of the oven with your favorite jam or cheese! Make it for St. Patrick’s Day this weekend! If you could name a favorite type of bread, what would yours be? I’m not sure if it’s because my taste buds have changed since I’ve had my kids, but I am slightly addicted now to the taste of rye flour. It could seem a little odd, but I just can’t explain it. 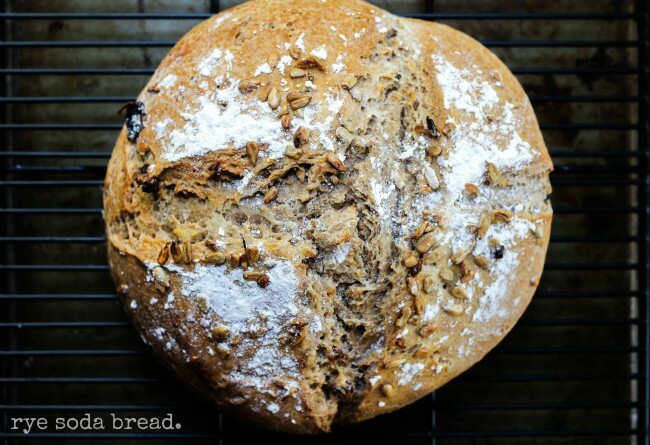 That is why I have been itching to share this super simple rye soda bread for ages here. 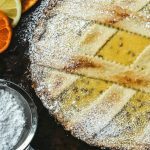 What took me so long to dive into sharing something with rye flour, who really knows. It could be since this summer when we had a chance to explore the Dolomite region of Italy. I am in love with this gorgeous region of Italy. The mountains are breathtaking and the food is not what you may find in any region of Italy. I will share more here on our trip in a future post…I promise! 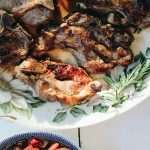 Every region of Italy has slightly different flavors that are a part of that particular region, but here things seem to be a little different and unexpected. I fell hard for this flat, round bread called schüttelbrot. It is a bread made with rye flour and they eat it with their local cured meats and cheeses. 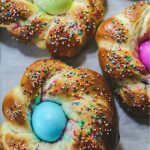 I researched a little the method to make this special bread that is shaped almost like a frisbee, and I am always up to a bread baking challenge, but there was no way I was going to perfect the method without some practice. That was not going to stop me from sharing something with rye with all of you! If you have a chance to delve into baking with different flours, consider exploring rye. 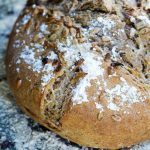 Rye bread made entirely with rye flour is healthier for you, but in this recipe you will also find some unbleached white flour. I didn’t know how my kids would feel about going totally rye. Also, if you make the bread totally with rye, it tends to be a very heavy loaf. You could add unbleached white flour and even experiment with adding something like spelt flour to your loaf. Traditional pumpernickel and rye breads are made with a sourdough starter, rather than yeast, to aid in rising. Since this was a quick bread, there wasn’t the need for yeast, or a sourdough starter. But I will be exploring a different bread with a sourdough starter and rye flour this year. Have you ever wondered how rye breads ended up being so popular in America? I did! I read up a little on the history of rye bread and found out that when Eastern Europeans came to the States in the early 20th century, they brought with them their love of rye breads. There are all sorts of rye breads. If you use a sourdough starter to make the bread, it will have that familiar tangy taste in every bite. There are also different grades of rye flour: pale, medium, dark and darkest. some notes on this recipe: This is a bread that is similar to the Irish Soda bread here that is actually called a spotted dog (because of the addition of raisins!). I found that recipe in an older Gourmet magazine of mine. I have a minor cooking magazine and cookbook addiction. I have shelves and shelves of different types of cookbooks. There was a phase when I was exploring vegetarian and vegan recipes. One of the first books I grabbed while in that phase was Heidi Swanson’s Super Natural Every Day. I am also a huge fan of Heidi’s super lovely blog! I am always inspired by the simple beauty of her writing, photos and recipes. No flash. No bells and whistles. Nothing that seems too difficult to try. I had in my memory this gorgeous rye bread that was dusted with flour. Heidi explained in the intro: if you’ve ever thought you don’t have time to bake bread, I suggest starting here. So being inspired by Heidi’s words, if you’ve ever thought baking bread is too time consuming or difficult, try this bread out first. The bread was vegan, as I used coconut milk to make a vegan buttermilk. I added a couple of teaspoons of white vinegar to the coconut milk until it curdled…vegan buttermilk in a flash! You could use regular buttermilk or make your own regular buttermilk using milk. Everything is all mixed together in one bowl! If you don’t have buttermilk on hand, make your own by adding some white vinegar to your milk. Stir it all together. Dump it on a lightly floured counter and form into your loaf. It’s seriously that simple, people! I decided to add some raisins that were soaked in orange juice to add a bit of sweetness (you could soak them in a liquer if you prefer or even a wine). I also tossed on top some sunflower seeds to give it a little crunch and make it a bit more healthy. 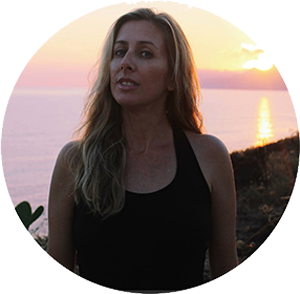 It is 2016 and I know everyone is thinking lighter, cutting back, exercising more. Did you eat one too many Christmas cookies the month of December? I sure did! So guess what, this bread is vegan and completely fantastic! This is all part of our #TwelveLoaves January New-to-You Flour baking challenge! 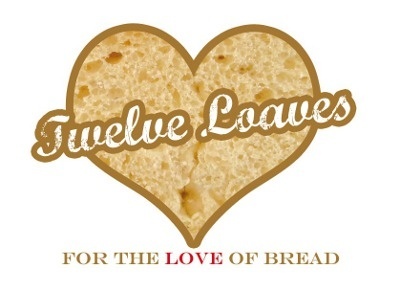 #TwelveLoaves is a monthly bread baking party created by Lora fromSavoring Italy and runs smoothly with the help of Heather of All Roads Lead to the Kitchen, and the rest of our fabulous bakers. This month we are baking New-to-You Flour Breads that are perfect to celebrate the holiday season. If you’d like to bake along with us this month, share your New-to-You Flour Breads using hashtag #TwelveLoaves! Here are 15 New Year’s Resolutions for you bread bakers (found via my bread baking friend Karen). I really like number 12, “In 2016, I will encourage at least one friend to start baking bread.” Maybe this bread will encourage you to try baking bread. Maybe you will then inspire a friend. And then that friend will share it and inspire a friend…you see where this is going, right? 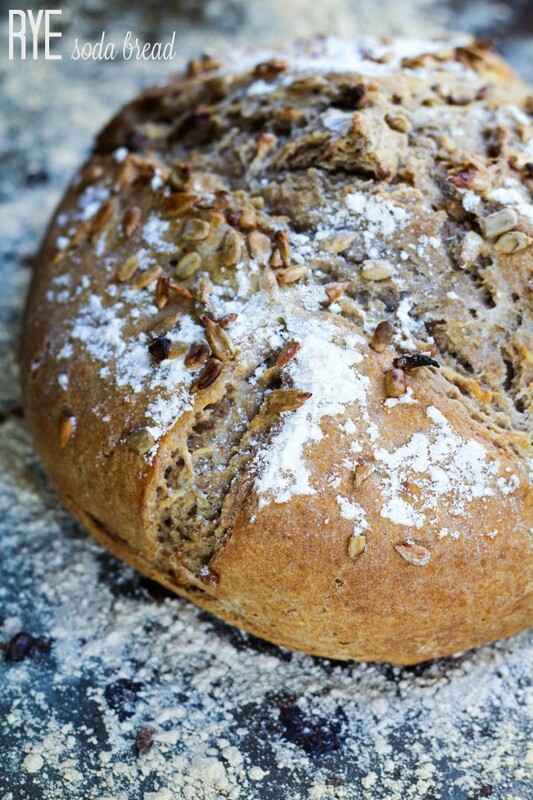 Micheal Rhulman‘s Classic Rye Bread with caraway seeds. 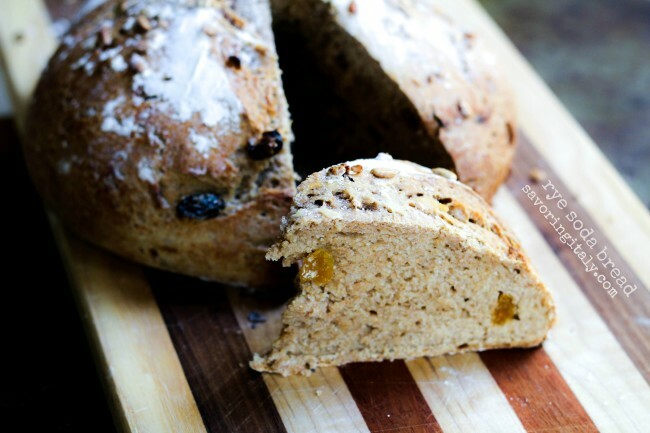 A typical Irish soda quick bread made with buttermilk and rye flour. So delicious when warm just out of the oven with your favorite jam or cheese! Make a well in the middle and pour in the buttermilk and mix in the currants (if you are using them). Stir just long enough to form a dough, then turn out onto a clean and floured countertop (or pastry board)and knead/shape for no more than 30 seconds to form a ball. Transfer the dough onto a floured baking sheet and flatten the top a little (so it’s closer to a tall disc than a round ball). Brush with more buttermilk and sprinkle with about 2 Tablespoons of flour and sesame seeds (if you are using them). Cut 2-4 slashes in the dough. Lora, it looks so yummy! I love the step-by-step instructions, making it an easy recipe to follow! Lora, this is so tasty! You do such a great job on your website–great directions and presentations. 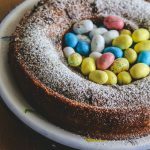 Thank you for sharing your excellent recipes!